"The Batman has no limitations." That's not just a cool thing for Christian Bale to growl on camera, it's a pretty decent assessment of Batman's canonical skill set. He's a nigh-unbeatable martial artist, a ninja master, a brilliant scientist, a successful industrialist, and, as you might've heard, he's also the World's Greatest Detective. There are very few things he doesn't excel at, and even fewer that he just can't do at all. They do exist, however, and there's one character who can do quite a bit that Batman can't: the Joker. As Batman's arch-nemesis, he pretty much has to have the skills to keep the Dark Knight on his toes. From skipping right over the lines that Batman won't cross to unique skills that only exist for evil, from his penchant for the grotesque to his curious knack for failing at something, here are the things that the Joker can do that Batman just can't. 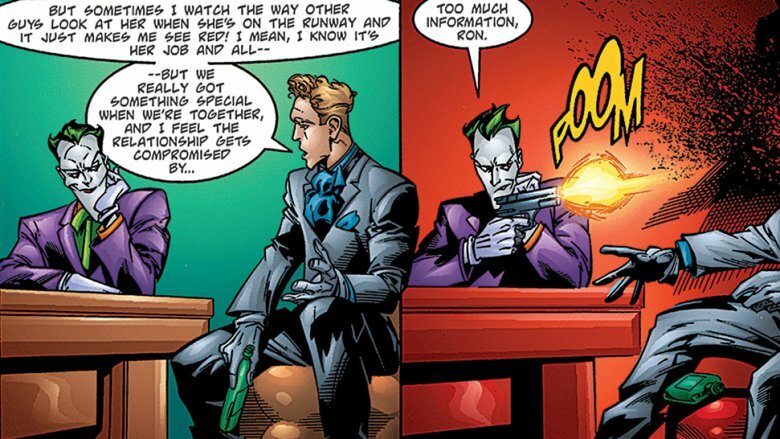 While there have been plenty of stories over the years where the Dark Knight employs lethal methods in his fight against crime, the idea that Batman doesn't kill people has been a pretty solid general rule in comics since 1941. Not coincidentally, that's about as long as the Joker's been murdering people by the dozens. 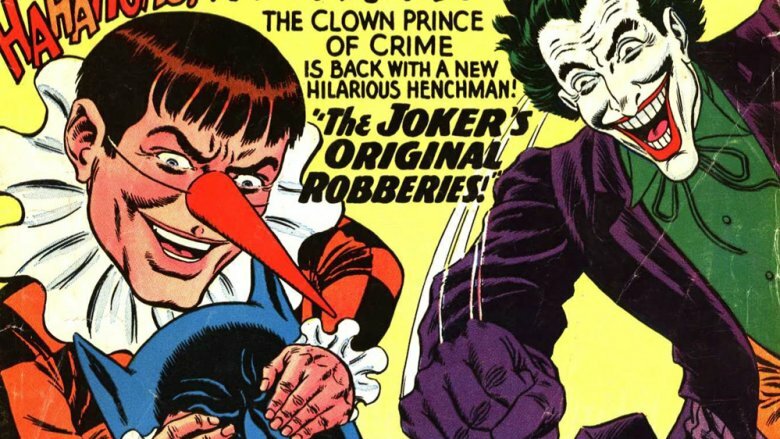 In Batman #1, the comic that contains the Joker's first appearance (and technically his second, if you ever want to win a sneaky trivia contest), the Clown Prince of Crime manages to murder no fewer than twelve people through a combination of poison and good old-fashioned handguns. That pretty much set the tone for the next 75 years, and even though he spent a few years focused more on bank robberies and gimmick crimes, he's more than made up for it in the years since. The DC wiki even has a running tally that puts his body count at over 540 on-panel deaths, with 140 of those happening since 2011. It's not just quantity, either, with high-profile deaths like Jason Todd, the second Robin — which was later retconned — and Sarah Essen, Jim Gordon's second wife. With all those twos, you'd think Harvey Dent was the one responsible. There's no other Batman villain with a body count that even comes close. In fact, if you don't count cosmic threats who have destroyed entire parallel universes, there are no villains in the entire DC Universe who have even come close through individual acts of violence. Even if Batman was a killer, it's hard to believe he'd go that far. As far as we can tell from the comics, the henchman industry is the cornerstone of Gotham City's economy. It's a business with a long and proud tradition of people making a living by wearing matching outfits and trying to look tough while standing behind the Riddler. Here's the thing, though: Batman's been around long enough that if you're a henchman, you know exactly how your night of crime is going to end up. Maybe — maybe — the Penguin or Bane or even Kite-Man could take the Dark Knight down, but he's definitely not going to have a problem with the lower-tier criminals. Still, people keep on signing up to work with the Joker, and it's not just a few of them, either. He has complicated, wheels-within-wheels plans that involve elements like nuclear missiles or literal parades through the streets of Gotham City. He needs an organization, and he pulls it off even though he's an unrepentant homicidal maniac who's just as likely to shoot his own men as he is to shoot Batman. No one seems to mind that his obsessive plans for breaking the Caped Crusader's iron will cannot possibly be profitable, even before you get to the part where Batman himself shows up and hands out concussions like they're fun-size Snickers on Halloween. There's a reason he's never short on henchmen. The Joker is many things, but he is absolutely not someone that you say no to. It's a little bit of a paradox, but even Batman can't scare people so much that it makes them fight Batman. Since his debut as the sensational character find of 1940, Robin has been synonymous with the very idea of the sidekick, inspiring imitators like Speedy, Bucky, and countless others. He is not, however, a very intimidating sight. Of course, he's not meant to be. Intimidation is Batman's job, and Robin's is to be the bright counterpart to his darkness — or, you know, to draw fire if you don't feel like being charitable about it. The Joker, on the other hand, is different. He's literally a murder clown who spends all of his time devising increasingly theatrical homicides, so you'd think he'd have a sidekick who was a little less terrifying. And he did, eventually, when Harley Quinn was introduced in the '90s. His first recruit, however, was Gagsworth A. Gagsworthy, and he proved to be troubling, to say the least. 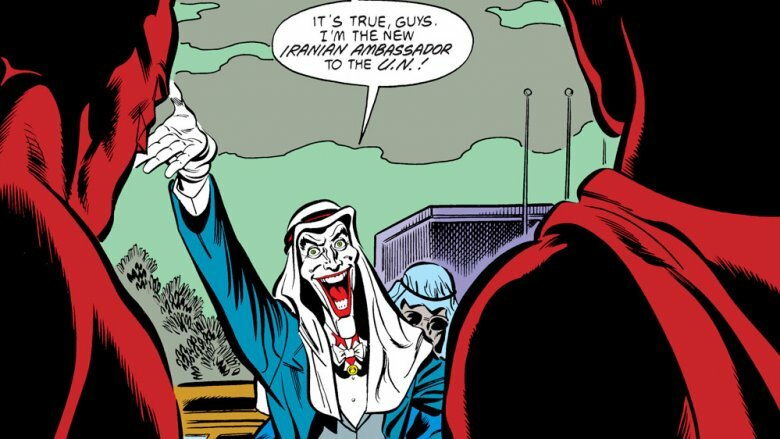 Introduced in Batman #186, Gaggy was a "refugee from the circus" who dressed up in a child-sized harlequin costume and helped out with some otherwise unremarkable robberies. Gaggy's whole deal was that he would hide in the rafters and then drop down onto someone's shoulders and try to gouge out their eyes while saying things "his mask's so tight — gotta wriggle my fingers under it!" And the worst part? Gaggy's still out there… somewhere. Considering he's someone whose entire origin is built around childhood trauma driving him to commit to a life of self-sacrifice and violent confrontations, we'd imagine Batman's brain isn't exactly a pleasant place for a mind-reader to be. Still, he's never driven someone insane just by giving them a peek inside his psyche. We know someone who has, though. On multiple occasions, the Martian Manhunter — you know, the guy with all of Superman's powers plus he can turn invisible and read your mind, and who keeps the entire Justice League telepathically linked — has been confronted with Joker's brain. It did not go well. Once, he had to physically reshape his own brain in order to comprehend what he was seeing, and when he took the Justice League into the Joker's mind, they were subjected to what seemed like hours of torture in the span of seconds. It's not just mortals who have that problem, either. 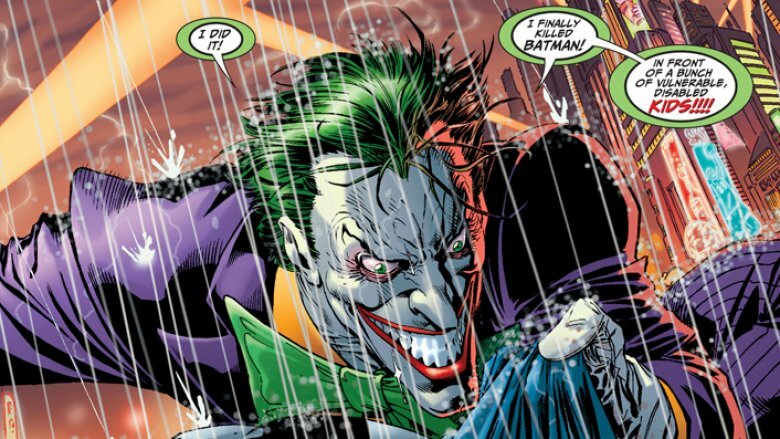 When he entered the Joker's mind to determine whether he was fit to face judgment, the Spectre — the literal embodiment of God's wrath — was so overwhelmed that the Joker was able to briefly take his powers. 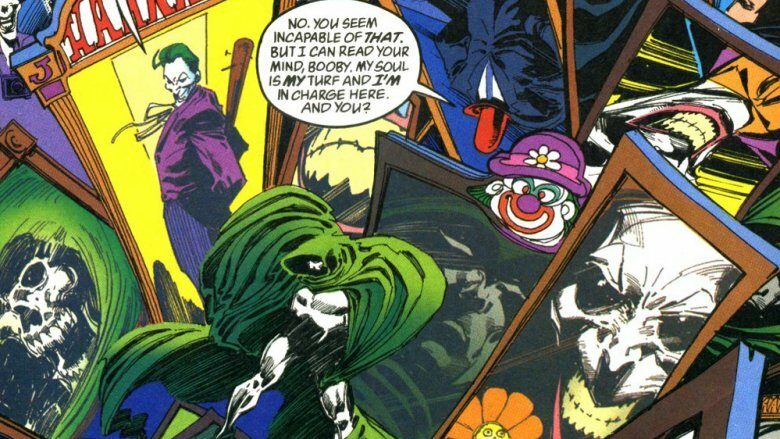 Eventually, the Spectre got them back by momentarily giving the Joker exactly the sort of conscience he lacks, and the Joker was so overwhelmed by the horror of what he'd done that he was shocked into a coma. The fact that he can bear that burden under normal circumstances without even a hint of hindrance should tell you just how much his mind affects anyone who takes a peek. Batman's relationship with the police has changed quite a lot over the years, from the duly deputized lawman of the '60s to the wanted vigilante who slugged it out with crooked cops in Batman: Year One. Even at his most chummy with the law, though, if Batman started doing major crimes like murder, they'd probably try to arrest him. We've seen it happen. We've seen the Joker be arrested plenty of times, too, but for a while there, the cops couldn't touch him. Not because he was evading them, but because they were legally forbidden to, since he had diplomatic immunity as the official United Nations ambassador from Iran. No, really. And that was as canon as it gets. 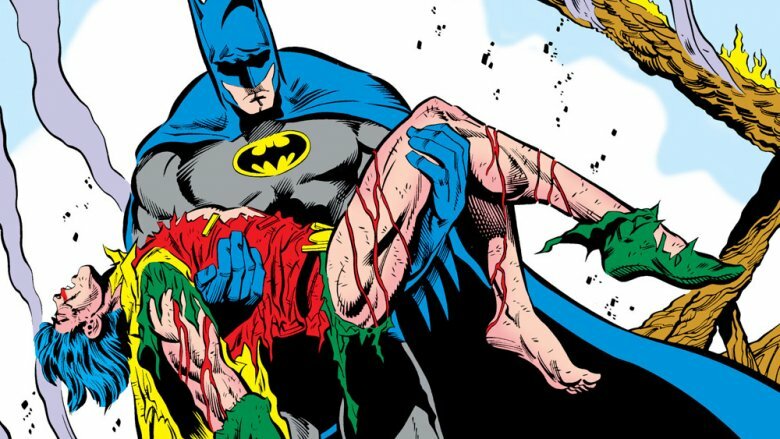 Most readers might remember 1988's Death in the Family storyline for the scene where the Joker beat Robin with a crowbar and then blew him up with a bomb. What's a little less remembered is why Batman wasn't able to bring him in for that crime. Just like Lethal Weapon 2, it was a case of diplomatic immunity, a bizarre little trope that still cropped up well into the 2000s. Batman's done a lot of things, but he's never represented a sovereign nation at the U.N.
Batman is human. Sure, he's capable of whatever amazing feats a comic book creator can imagine, has the kind of unlimited fortune that can only exist in fiction, and owns an arsenal that (even at its most basic) includes a rocket-powered super-car, but underneath it all, he's just a man. It's a huge part of his appeal, that there's always that vulnerability to him, even if we never actually see it. As a result, we all go into a Batman story with the unspoken agreement that if he was to, for example, have his face cut off, he would probably die. You probably know where this is going at this point. 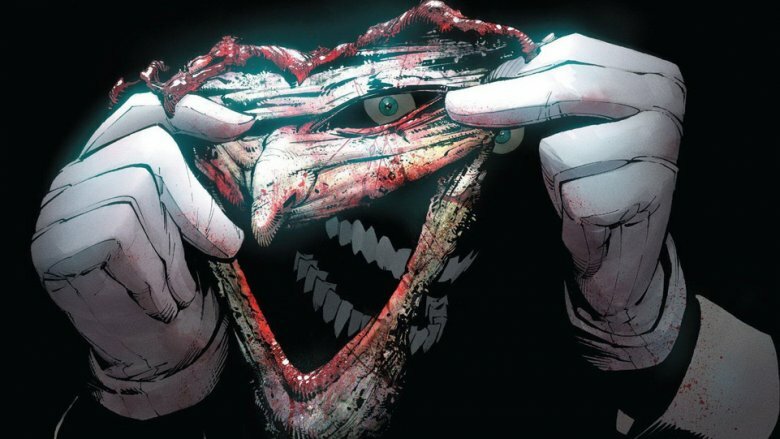 In 2011, when the DC Unvierse rebooted as the "New 52," the actual, honest-to-God first thing that the Joker did was have a villain named the Dollmaker cut his face off, and then he left it tacked up on a wall in Arkham Asylum. Why exactly he did this was never fully explored (although it was explained in detail how it grew back later, and yes, it involved magic metals from another dimension), but he spent the next few years presumably not having a face. Even weirder? When he showed up for a massively murderous crossover called "Death of the Family," he wore his severed face as a mask, holding it on with leather straps. That's weird. So weird that even if Batman could do it, he probably shouldn't. Crime never takes a vacation, which means that Batman doesn't either. His dedication to his quest is so all-consuming, and Gotham City is in danger so often, that he rarely takes a rest, even when he needs it. Super-criminals, on the other hand, are free to take as many breaks as they want, assuming that they're not busy paying their debt to society in an asylum that seems to be held together with spit and chicken wire. There's always somebody like the Cluemaster or the Electrocutioner waiting around to take their shot, so why not? 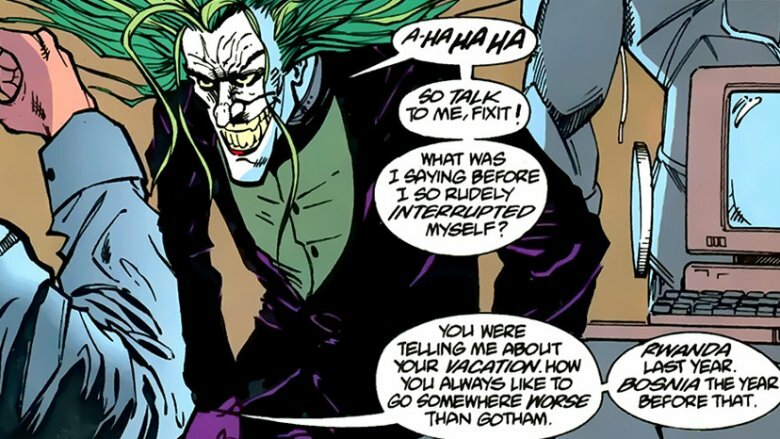 That's not just speculation, though — canonically, the Joker always makes sure to take a vacation once a year. The catch? According to Aztek: The Ultimate Man #6, he only goes somewhere worse than Gotham. Given the state of the DC Universe in the late '90s, when Gotham was afflicted with two plagues and an earthquake on top of all the other "regular" supervillain attacks, that meant going to some pretty bad places. And when the Joker takes these little trips, Batman sees it as his responsibility to bring him back to justice, meaning that whenever the Joker takes a vacation, Batman, by definition, has to work. There have been an awful lot of stories over the years built on the premise of being the "last" Batman story, showing readers what happens when the Dark Knight finally gets old. More often than not, these stories end with Batman's death. Even the Golden Age Batman, who lived out his days on Earth-2, didn't survive long enough to see the DC Multiverse destroyed. He kicked the bucket back in 1979, killed by a villain that you've almost definitely never heard of. The Joker, on the other hand, always seems to stick around. 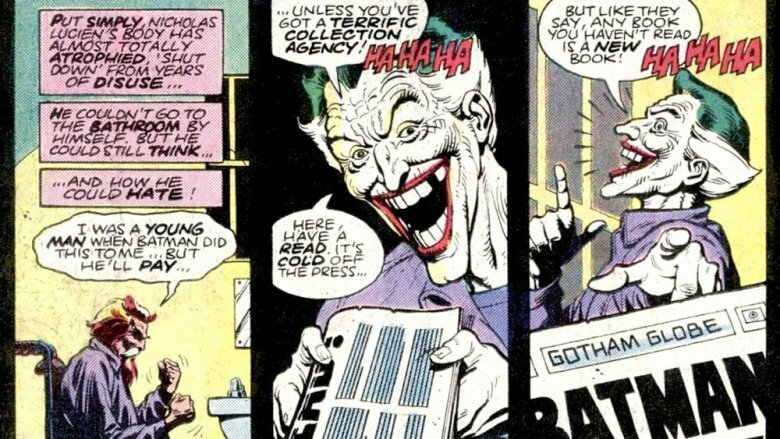 Earth-2's Joker, for instance, was alive and well in 1983's Brave and the Bold #200. It's only a brief appearance, where an elderly Joker is cackling at a headline reporting his old nemesis' death. Weirdly enough, he's not even the main villain of that story — but why would he be? His Batman was dead, and what's the Joker without him? The major exception to this rule, of course, is the apex of the "old heroes" story: Kingdom Come, in which the Joker follows his hairline to the grave thanks to a violent superhero named Magog. In that story, the Joker murders Lois Lane and Jimmy Olsen, and when Magog is (understandably) acquitted of killing DC's most prolific mass murderer, Superman goes into retirement. Here's one thing you can't take away from Batman: he's massively popular. He has been since the start, propelling Detective Comics to such heights that its publisher, National, would eventually rename their entire company after it. He's starred in thousands of comics, and there were years where a brand new issue would hit the stands every week, with no shortage of additional one-shots, miniseries, and other books stocked on comic shop shelves, too. 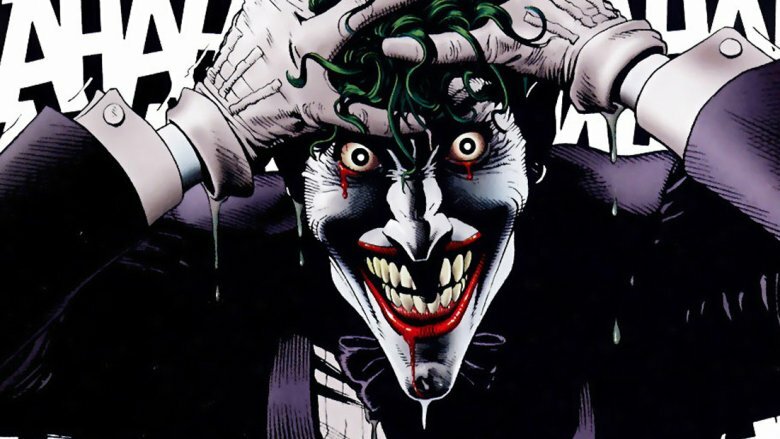 The Joker, of course, is also popular — arguably the single most popular villain in the history of superhero comics. 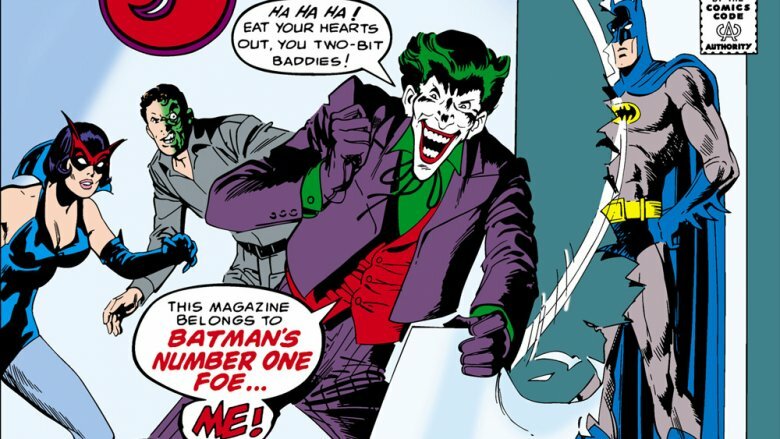 But while Detective is closing in on 1,000 issues (with Batman totaling another 600 and change across three volumes, not to mention all those other Bat-centric titles), the Joker's one and only solo series got the axe after just nine issues. Of course, that was back in 1975, with a pretty different version of the character than we have today. It wasn't that great, probably because it's difficult as both a reader and a creator to get behind the Joker as a protagonist. It also didn't help that he was up against antagonists like Willie the Weeper and some random dude who got hit in the head and thought he was Sherlock Holmes. Still, the Joker's a proud clown, and it has to sting a little bit that his solo outing couldn't even break double digits. Look, we hate to say it, but Batman doesn't have a spotless track record when it comes to his sidekicks. Jason Todd had his brains bashed in, the Spoiler was tortured to death with a power drill by Black Mask, Sasha Bordeaux was shanked in prison. Even his own son Damian died, which wound up driving Batman so crazy that he tracked down Frankenstein to figure out how to bring corpses back to life. Sure, all four of those people came back to life eventually — even if it took a full 20 years in Jason's case — but they still went through all that stuff, and died as far as readers were concerned. But the Joker? Believe or not, he's batting a thousand. Harley Quinn is not only alive, she's also become one of DC's most popular (and marketable) characters over the past couple decades, with multiple ongoing series that have lasted longer than the Joker's ever did. Heck, even Gaggy's still alive somewhere out there in the Multiverse — he was in comics as recently as 2009! Batman couldn't keep Robin alive, but the Joker managed to keep Gaggy friggin' Gagsworthy around for 40 years! If that's not notable, we don't know what is.